Tiny Tina's Assault on Dragon Keep will bring roleplaying madness to Borderlands 2 this June. 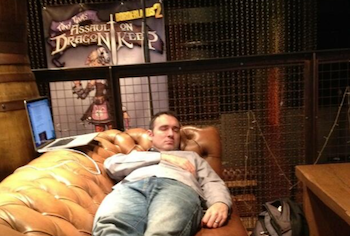 It all started with a tweet from Borderlands writer Anthony Burch showing a picture of Gearbox PR rep Steve Gibson sneaking a nap. Partially concealed behind the couch was a poster for an unreleased bit of Borderlands 2 entitled "Tiny Tina's Assault on Dragon Keep". The tweet was quickly pulled, but not before StealthyBox grabbed a screenshot. With the proverbial psycho midget out of his crate, Gearbox decided to officially reveal it later that day, confirming that the fourth and possibly final piece of DLC is coming this summer. Observant consumers of games journalism might recall that just such a product was teased at PAX East. A short 3-minute clip showed the original vault hunters hunkered over a holo-board as the world's deadliest 13-year-old attempts to lead them through a game of "Bunkers & Badasses". True to the teaser, you'll play characters being role-played by other characters, while Tina narrates the action and changes boss attributes and monsters on the fly. Tiny Tina's Assault on Dragon Keep will be the fourth DLC pack released for Borderlands 2. It follows Captain Scarlett and Her Pirate's Booty, Mr. Torgue's Campaign of Carnage and Sir Hammerlock's Big Game Hunt. While the season pass only mentioned four addons, Gearbox has yet to confirm that Tina's roleplaying excursion will be the final one. Tiny Tina's Assault on Dragon Keep will launch on June 25th for Steam, Xbox 360, and Playstation 3 and will cost 800 MS points or $10. Of course if you're a season pass owner, you'll receive this last bit of goodness for free.